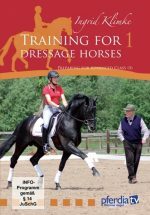 Philippe Karl - Classical Dressage Part 4: Training progress "One Year Later"
In the fourth DVD in his Classical Dressage series, Philippe Karl presents his School of Légèreté (lightness) as a series of prerequisites and goals. His training philosophy is inspired by the most accomplished masters, including la Gueriniere, Baucher, Beudant, and L’Hotte, and is founded on absolute respect for the horse. 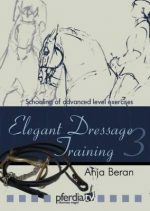 Basic knowledge of equine anatomy, motion, balance, and psychology enables the rider to get the best from any horse without using force or training gadgets (such as side reins, running reins, and the like). 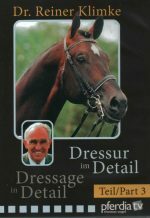 The School of Légèreté is not only a pleasurable experience for horse and rider, it is also the kindest and most efficient way to achieve real collection and an expressive horse, both on the flat and over jumps.In Part 4, viewers see Sampaio, a six-year-old Oldenburger stallion, and Quiela, a seven-year-old Luisitano stallion, one year after they progressed through Parts 2 and 3 of Karl’s DVD series. Both horses show how they have developed. Philippe Karl, the founder of the School of Légèreté, was a member of the famous Cadre Noir in France for 13 years. 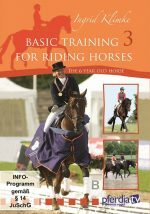 He is well known throughout the world as a riding instructor, trainer, and author. 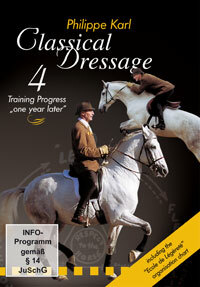 His impressive classical dressage presentations are treasured by those privileged enough to see them all over Europe. In clinics and courses, Karl presents the knowledge and the aesthetics of the founders of equitation, adapted to modern times.